This beer poured into a strange glass (slender cylinder) produced a mostly clear brown/amber hue with very nice head retention. The smell brought forth hints of honey and spice. Fairly dry with a lot of clove notes that linger, a little ripe banana in there too. Mildly bitter. 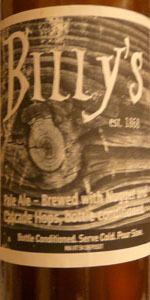 The label advertises Cascade and Nugget hops. Therefore I anticipated a bit more of a citrus edge than what was there. I'm looking forward to trying some more offerings from this local upstart.